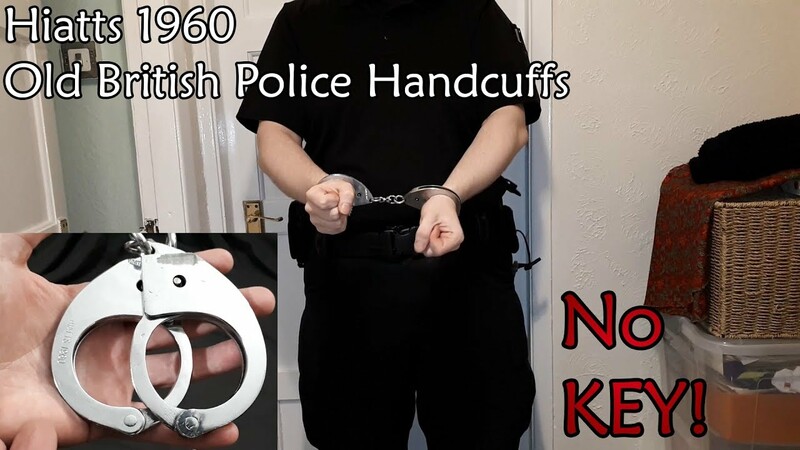 This is the new and improved Kel-Met rigid handcuff, known as model KM 2000. This is a rebrand called BlueLine, which still has Kel-Met stamped on them as well. Made in Poland. Not related to the Chinese "Blueline" brand I overviewed a while back. The original backloading had an issue where the last 3 clicks could be mistaken for normal handcuff size positions and in this case double locking was non-functional despite being engaged. So after contacting Kel-Met about this, a month later I received the improved model. It is a rigid handcuff, similarly sized and shaped as British TCH 840 handcuffs. The keyway orientation is different from that of TCH, in that it is sideways similarly how Peerless and Alcyon handcuffs are. 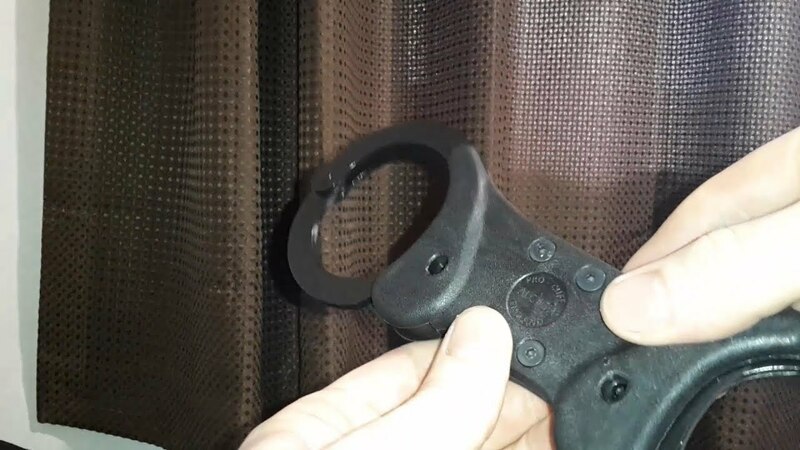 These handcuffs are rigid when left assembled but if you disassemble the plastic grip cover, the two cuffs are capable of swivelling around in place, while staying rigidly connected. These are made of stainless steel, so cause less or maybe even no allergic reactions on the skin. They are strong and seemingly have no need of ditched jaws, according to Kel-Met. There is a visual outline of the ditches but there is no peg or protrusion that fits inside them. This is a much improved model in my opinion to the prior model, although I feel there is room for further improvement in that at present only the last click is not safely usable due to not being double locking capable. I have heard this is a somewhat common issue with various basic-backloading handcuffs. But I would like to see this get resolved and maybe improve tolerances on the mechanism so that when double locked the pawl bars are more firmly in place and unable to move. All this said, I would say this new revised model is a worthwhile handcuff and I would be much happier using this model in a professional context than their original one. These Hiatts 1960 handcuffs are Britain's first swing-through cuffs issued to the police. Prior to these handcuffs, the British police were mainly using the old "irons" type of handcuffs from way back in the day. 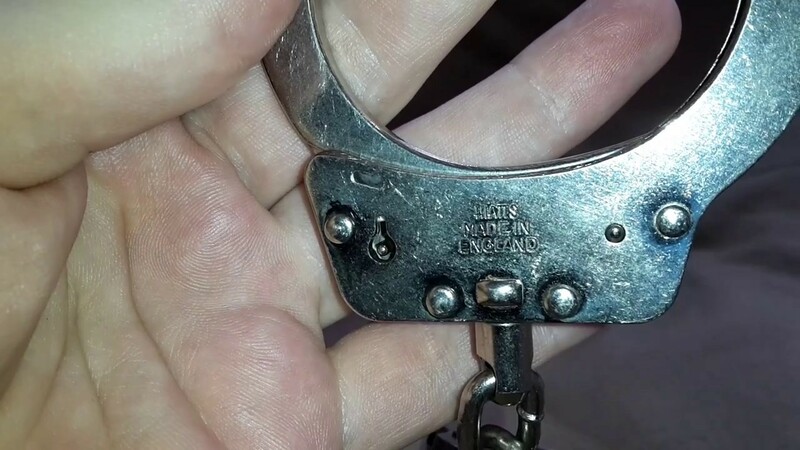 These Hiatts 1960 used a round key that is entirely different from today's handcuffs. They are surprisingly good, for how old they are. They are swing-through, they have 2 pawl bars making picking more difficult and they have a double locking mechanism for safety. While picking the double lock is very easy, getting them unlocked is a bit more of a challenge haha but after a few minutes of trying various items I was able to undo them. Knowing basically how they work, I will be making a key for them eventually. The tolerances seem very sloppy on the inside, meaning things move around and what not, but that also made it more difficult to open than I was expecting. Over all, they are very good handcuffs for their age and paved the way to get the British Police familiar with swing-through handcuffs prior to getting the more modern design you are used to seeing. These are a pair of light weight High Security handcuffs from Brifield model C2. They are good & secure but quality control could be better. From Amazon UK. These have 3 pawl bars which are separated, in the same way the old Yuil handcuffs used to have 2 separated pawls. This means you must use their special key which is a 3-bitted key. You get 2 keys with each pair of cuffs. The keys are all solid, unlike most handcuff keys which are hollow. There is no keypost in these, so the keyway goes through both sides to allow key usage from either side. One side did back-load but this is either a defect which made it happen on one cuff when it is not a feature, or a defect causing one side to not backload. The edges are not smooth and are a bit uncomfortable, similar to a pair of Alcyon I had a while back. One thing I pointed out (I pointed downwards) was about the anti-shim protection. If you recall, Yuil handcuffs have two little flaps which are folded over to catch even special split pawls. In these Brifield handcuffs those flaps exist also but are standing up and not folded over, so the way they come from the manufacturer they are useless at adding any extra protection. Maybe they could be bent over by the buyer but I have not done this in case there are issues which made them not do this on purpose. Over all, I like them, but the quality issues in my case would be a problem for me if I were to desire to use them in a professional setting. They are likely Chinese since I have seen similar models on Chinese marketplace websites. In fact I have since confirmed with the seller that they are Chinese police handcuffs. They are made with aluminium, so do not lubricate with graphite because graphite and aluminium do not mix well. A video comparing quality and security of the cheapest handcuffs I could get in 3 different brackets, ranging from garbage, ok, good. The first black pair of garbage single locking metal "toy" handcuffs cost about £4. The second pair, the pink ones, are of medium/ok quality and cost about £9. The first handcuffs are single locking only, which makes them unsafe, even for children because if someone falls over while wearing them, their wrists could get crushed when the handcuffs get tighter immediately. Plus the metal is thin and would cut into them easier than thicker handcuffs. Also as far as security, the chain link swivels are total trash and the chain links are not welded so could be pulled open with some average adult strength. The grade that the pink handcuffs came in was, I would say decent. They are double locking, although the double lock is not as definitive when engaging as many other better models of handcuffs. The metal is thicker and I was unable to bend the double strand with my fingers, which is good. Although there are no ditches in the rotating arm. The purpose of ditched "jaws" (as they are referred to) is to ensure that someone who is very strong, cannot pull outwards and pull the teeth of the "jaw" away from the teeth on the pawl bars on the inside of the handcuff. These pink ones lack that feature. So they are an averagely good non-professional model of handcuff that should be safer to use for people. Normal handcuff keys cannot be guaranteed to work with the pink handcuffs because they lack a larger internal space between the two cheek plates, so you need smaller keys. But you get 2 keys with them. The last pair are a genuine black pair of Spanish Alcyon handcuffs. They are made with thick carbon hardened steel and can make use of normal handcuff keys. They have ditched jaws for higher security from strong people, the swivels are strong, On chain link versions the chain links are welded for strength, while this model I have has a "universal joint" which has a bit more resiliency than a chain link model. These also have 2 pawl bars, that is 2 sets of teeth on the inside of the handcuff for extra security. So I leave this to you to decide if you buy handcuffs what you want to spend your money on. I recommend you buy as good of a quality as you can afford, for the purposes you need them for. I do not recommend young children use metal handcuffs of any kind and for more mature children, make sure they have a real pair and know how to use the double locking mechanism. 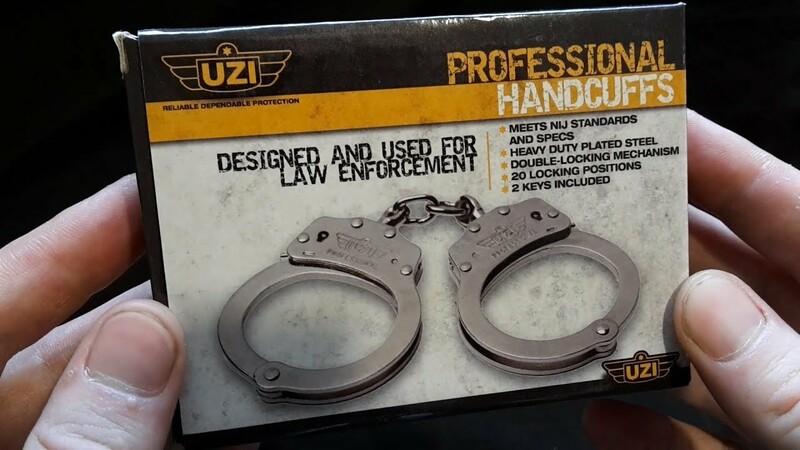 These are the UZI Professional Handcuffs and are fully NIJ certified. Manufactured for UZI by CampCo. These are from the famous UZI company. Yes the weapons company UZI. They do have the main features you would expect for professional law enforcement LEO use handcuffs such as double locking and ditched jaws to ensure a strong person cannot pull the arm away from the pawl teeth etc. They even have 2 pawl bars, opposed to how most US handcuffs have one single big lawp. So that is a nice thought to added security from picking and shimming. However the quality of these is similar to that of the Chinese high security handcuffs I overviewed a while back. Quality of these is sub-standard in my opinion. 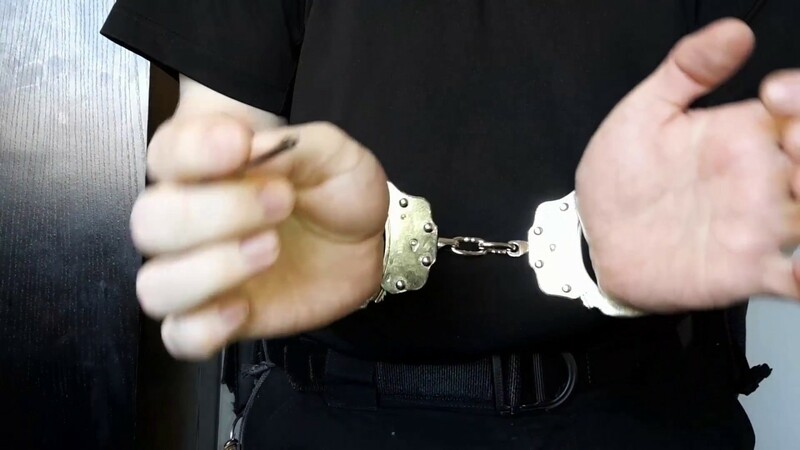 The swinging arms are not perfectly aligned and sometimes "clink" stop when trying to press them onto the wrist (seen in section 2 demo section of the video) and they swing open because the teeth never engaged because the arm clipped the edge of the cheek place of the handcuff. Their keys have a cheap generic look as well as scuff marks. Even on the handcuffs themselves there are manufacturing scratches and scuff marks. Then on top of that, the double locking pin access on the side of the handcuffs are protruding outwards which makes double locking them more difficult. There should be a bit of a dent where your pin on the handcuff key easily slides into, at which point you press the double lock inwards. 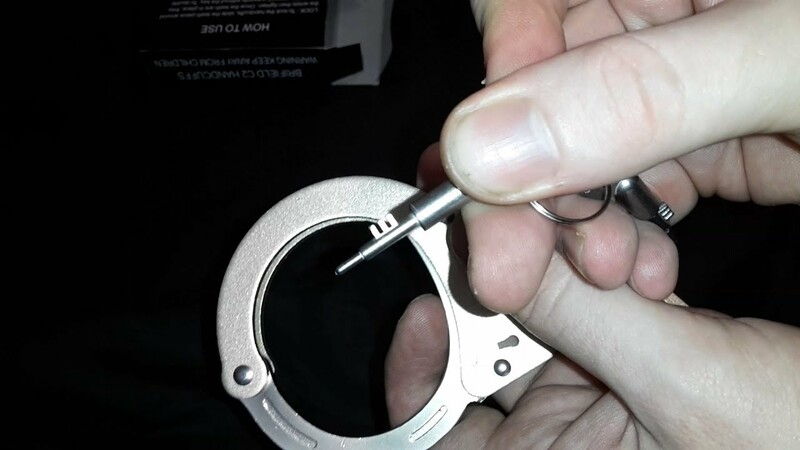 But since it sticks out, unless you aim the key 100.00% accurately, the key's double locking pin will slip off the handcuff and miss the "hole" which is not a hole. You will see what I mean on the video. Over all, they have the features needed by professional but unless you buy 10 pairs of them to find one really good quality pair and send the other 9 back, I would not bother. The only good thing about these handcuffs are the features + the lower price. If you can go with another brand, I would. Pay the extra little bit of money and get better quality. Edit: Even though they were in a sealed plastic bag, there was some rust around the chain's swivels and surrounding area of the body of the handcuff. After some work, I was able to remove 97% of the rust and after some oil around the swivels and the inner locking mechanism, everything works smoothly, even the double lock, which before oiling was extremely difficult to disengage as the video demonstrated. These are the Yuil M-09 K Light Weight Silicone Lined Higher Security Handcuffs. They have higher security from raw picking and shimming than most handcuffs and they have a special silicone lining which is described by Yuil as protecting human rights by helping to prevent injury. Normal handcuff keys work with these handcuffs. The picture on the site, I suppose shows a previous design because I was hoping to receive the angled keyway which only works with Yuil high security keys. As it stands I have had contact with several suppliers of Yuil who have confirmed that standards have gone down. 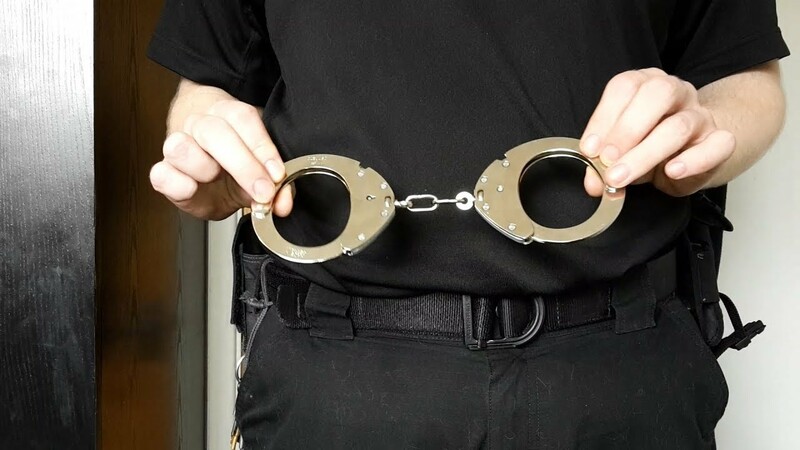 Police and military should be searching people for keys any way when they arrest someone, so the fact that actual picking is made more complicated, regular shimming impossible and special shimming more difficult due to the design of these cuffs still makes them more secure than most handcuffs. These are Korean and are of good quality and strength. I just wish they did not skimp slightly on the mechanism because I believe the older models had a slight advantage since only Yuil keys with the split-bit would work with them. This is an old lightweight model of Hiatt handcuffs, model 3103. Bought cheap off eBay, used, ex-police with serial numbers intact. Not too bad. I never had a lightweight pair of Hiatt so I was curious to give them a try and see what they are like. They are an aluminium or aluminum alloy but are very strong and according to the information I have seen, are also NIJ certified as you would expect from Hiatt handcuffs. 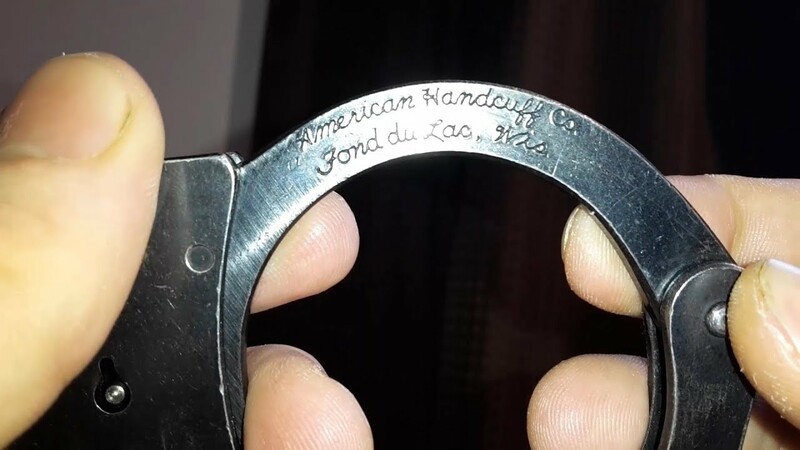 🚨 American Handcuff Co Model N100 Black - Era ~ 1980's "Fond Du Lac, Wis"
American Handcuff Co was sold to ASP in 2002-2003 who promptly shut them down. The old archived site of American Handcuff Co states their chain linked models as N105 which is the newest model that came out with prior to their acquisition and subsequent termination. These are in pretty good condition I would say. The previous owner looked after them pretty well and I cleaned them up further. They are fully functional and look great. Very very minor rusting on the outside at the time of filming, which I have since sorted out. They have 1 pawl bar, ditched jaws and double locking. They operate the same way Peerless handcuffs do. These feel like they are built like a tank! These are a pair of US Police Smith & Wesson M100-1 chain link handcuffs. High quality. These are a popular brand and model of handcuffs that are used by American law enforcement. They are high quality but are not high security. They have tight tolerances which is good, however since they only have 1 pawl bar, a thin enough shim has an easy job to do and since there is 1 pawl bar it means picking can be done relatively easy with the simplest of devices, such as a bobby pin aka hair grip. That said, they are wonderfully manufactured, look great, are relatively comfortable for people to wear and do the job they are intended to do. Temporarily secure people. Any self-respecting police officer would do a search for hidden keys and what not prior to proceeding with transportation of the prisoner any way. A similar brand you can check out on my channel is Peerless. Peerless do also wonderful handcuffs that are comfortable, extremely well made and also are slightly more secure than these Smith & Wesson due to the position and angle of the keyway. Pick locking tools would have farther to turn inside the mechanism before unlocking, making them a tad bit more secure. Both are high quality and very nice though. Don't get your new hinged or folding rigid handcuffs stuck on your arm like this! Many people this Christmas will have gotten handcuffs. Hinged? Folding Rigid? Handcuffs stuck on one arm ? You may not have the tool to save both you and the cuffs! In order to not have to resort to cutting the handcuffs off and destroying them, you will need a handcuff shim, which you may not have. 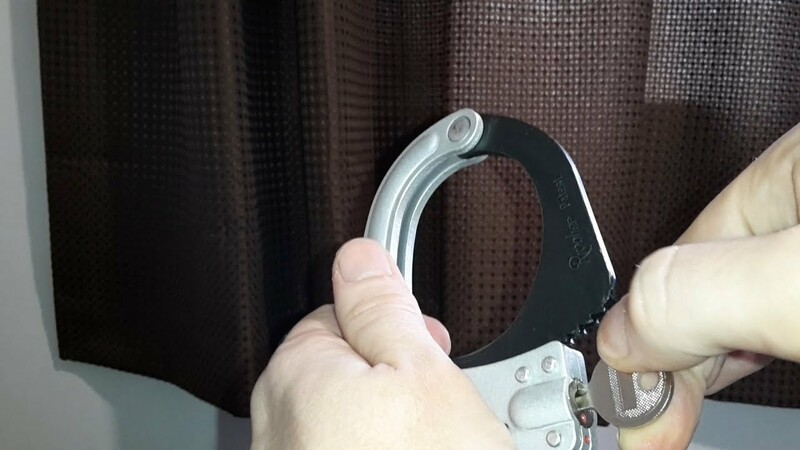 It is a strong but thin piece of metal that you force into the pawl area, tighten the cuff one or two clicks while pushing in the shim further, in order to hold the shim in while pulling open the arm of the handcuff. 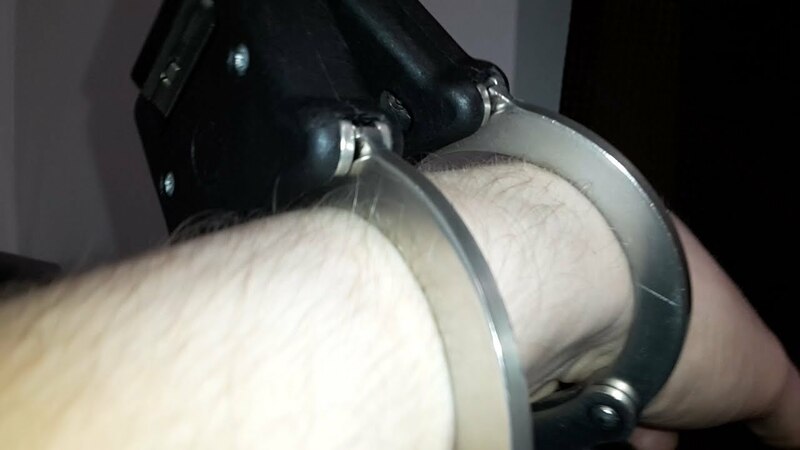 Best thing is to never ever prank anyone by locking a pair of hinged handcuffs on one person's single arm unless you are sure the keyholes are facing on the outside. Folding rigid handcuffs like Hiatt speedcuffs or TCH 850 only can fold with the keyholes facing inwards. You could try cutting up a beer can and folding a thin strip in half to double the thickness and try and use that as a shim but there's no guarantees it will be strong enough to not get dented by the pawl bars teeth. These Alcyon 5236 Universal Joint Handcuffs are the better, robust version of the last Alcyon I overviewed. These work with normal keys without needing specifically Alcyon keys which are unable to be purchased separately. Essentially if you have seen my early video on the chain link handcuffs, these are identical only with the universal joint instead of a chain. I do like these a lot. My pair are pretty stiff because I have not had time to break them in yet. But the tolerances are quite good, for Alcyon. If you want a cost effective ~ €20 pair of sturdy handcuffs that do not restrict TOO much, then these would be a great option. These Peerless 730 Superlite, are exactly that. SUPER light weight. They feel like toys, if it weren't for the cold feel of the metal. These are very string, NIJ certified handcuffs which are used by US police personnel who want to lighten the load on their duty belts. I have seen forums where officers have swapped from carrying one pair of heavy handcuffs and instead carry 2 pairs of these due to their very low weight. They weigh 147 grams if I recall correctly, even lighter than the last Yuil handcuffs I overviewed. These scream high quality from every angle. The finish is a nice grey matt (can come in black finish too). The fit and tolerances are perfect. I would highly recommend these handcuffs if weight is an issue and you still need strong high quality chain-link handcuffs. These Blueline model 500 handcuffs are made in China, but to a decent quality standard, a cheaper TCH alternative. I had to buy these. They looked very very much like TCH820 large handcuffs design (with similar wrist capacity as TCH/Hiatt speedcuffs) in a low price. Now the price has gone up to about £15 I noticed, but still a decent price. I would pay anything maybe up to £18 for these. The quality is not bad on these chain-link cuffs and the function is perfect, with the exception that the bow does not have perfect tight-tolerance alignment with the channel it has to pass. This leads to a similar effect as my previous Yuil video, where the handcuff does not positively engage on the first slap of the wrist. But, all in all, they are seemingly decent cuffs. It would be nice if they were finished a bit better because they can dig into you a bit unless you use a fine file/sand paper/sharpening stone to smooth out the harsher edges. They are not "SHARP" but they are non-rounded, if you know what I mean. I am happy to have these Blue line handcuffs in my collection. These are a really nice design. They have a single, special hinge that allows for an extremely good degree of movement, while not having a chain that can be broken by a special forces technique that can snap the handcuffs by using the chain and physics without needing any tools. This seems much more sturdy and less able to be manipulated. The keyhole is facing a different direction than you would expect from Alcyon. There are also more teeth on this handcuff. The wrist size seems to be a normal size. A very nice and unique pair of handcuffs. *A pity that the double locking mechanism is unreliable with non-Alcyon keys in this model. One side will open with a "standard" handcuff key but the other side will not disengage the double lock. I suspect this to be a problem with all Alcyon's models with the Smith & Wesson double locking design. This is the second pair I have witnessed this on. I sent the others back but because the Alcyon keys technically work, I won't bother sending these back. I will either keep them or sell them. I have other pairs that use unique keys, so it wouldn't be the first time I only have 2 or 3 keys to fit something. These Alcyon Pro-Cuff 5050-RB are made in Spain and have some pros and cons to them. 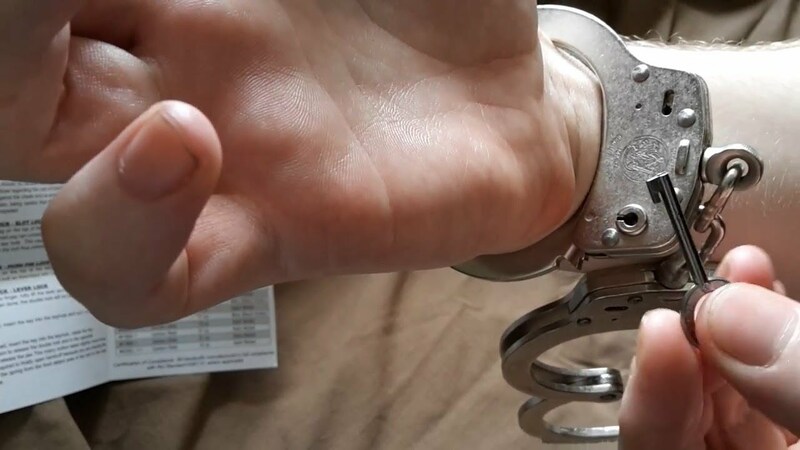 Firstly, they are a normal sized handcuff, which means they still fit the majority of people and will not let people spin the handcuffs as easily. This means it is more difficult, painful or impossible to swap your hands position, when handcuffed in a stack, in order to get access to a keyhole. This of course also means they will not fit people with abnormally large wrists (perhaps very muscularly built people and very overweight people. Related to the normal size of the wrist capacity, they are more restrictive in movement. When handcuffed in front, palms together, you cannot (at least I, with my weight) am not able to get my hands close to my body in comfort, due to the more restriction. In this regard TCH840 rigid handcuffs are more comfortable, with TCH850 folding rigid being the best. Also, the sloppy tolerances inside the mechanism, means there appears to be an accidental backloading capability by 1 click. This initially sounds like a benefit, until you realise that the final proper click, a click where it is still secure and not freely rotating, is not double-lock capable. If you double lock the final click, the handcuffs will over-close and freely rotate, causing a health and safety issue for people with small wrists who fall over while in the handcuffs. Nothing would stop their weight going onto the cuffs and crushing their wrist bones etc. I believe better tolerances (preventing all pawl bar movement when double locked) would solve this. I recommend Alcyon do this asap for safety reasons as well as added security reasons. Over all, I do like them, they are an interesting diversion away from TCH rigid handcuffs. But they could do better. Also there are somewhat sharp edges on the fibreglass outercover which could be smoothed prior to installation on the handcuff. Also, in regards to tolerances, the lateral unintentional movement of the rotating arms is kind of sloppy. One side of my cuffs is chipped by repettative use. This is because the arm rotates and has enough freedom of movement that it can land on the metal cheek plate, to the side of the channel where it should pass through. But when it hits this, it both stops the handcuff from positively interacting with the pawl's teeth and also chips away the metal, leaving a shiny silver dent where some metal is missing. Here is a look at what they look like when you remove the plastic: http://i.imgur.com/bcoYpbo.jpg The central bar is part of the middle of the both cuff bracelets, it is one solid piece running from side to side. 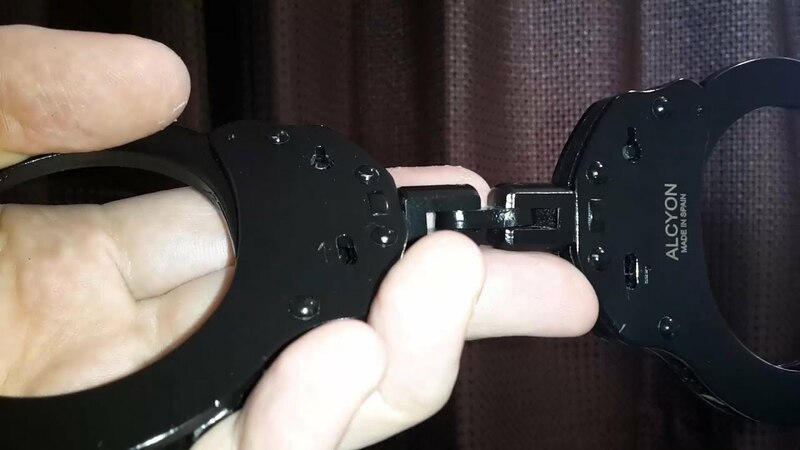 This is the new updated model of KM 1000 Kel-Met handcuffs. They are NATO standard and made with Stainless Steel in order to prevent people having a skin reaction to Nickel. 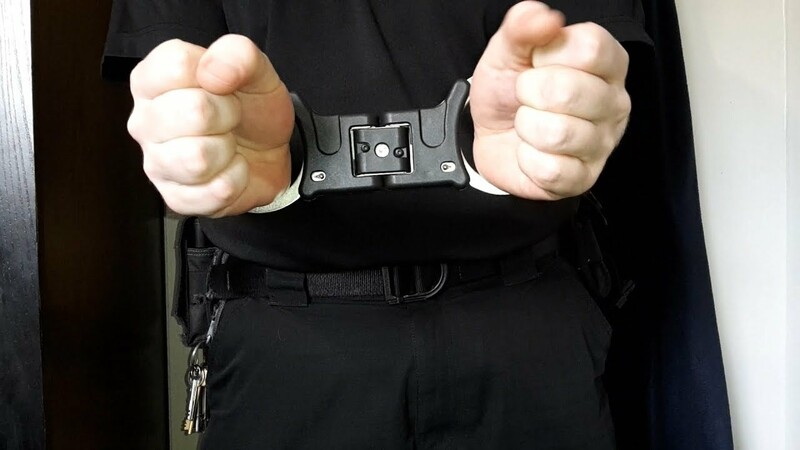 These are the fantastic TCH 850 Premier Folding Rigid Handcuffs used by the British police. NIJ Rated. These are essentially rigid handcuffs, that can be folded in half to make carrying them easier for police officers and also more covert. I have a video on a belt pouch designed for these cuffs, with a pair of TCH850B (black model 850) that I used to have. The fact that they fold means criminals are less likely to notice the tell-tail profile that standard rigid handcuffs have when carried. Also, some officers do not like to have big long handcuffs that could dig into them when they sit down etc. So these are a nice authorised alternative. They fold in half using the same normal handcuff key you use to operate the usual handcuff locking mechanisms. Once opened, they stay rigid with only a very very tiny amount of flex, so essentially rigid for all intents and purposes. Very comfortable for the person wearing them. The gap between the cuff bracelets is slightly longer, meaning when cuffed in front side by side, it is a bit more comfortable. However when cuffed in a rear stack, the slightly increased gap forces the arms higher and lower which could prove to be slightly more uncomfortable for people. A very very high quality handcuff. A pleasure to have in my collection. I wanted this silver pair from the beginning but I settled on the black due to the discounted price. I got these silver ones at a real bargain price on ebay. Brand new, sealed, boxed everything. I am very happy indeed! They are used by German police forces and according to their site, all over the world. My first thoughts were a nice interesting visual design, which then turned into a feeling that they were cheapo handcuffs. Now I have come to realise there are indeed good as well as bad points on these handcuffs as I will detail. Before we get to the good and bad sections, here's a fun fact: I have tried several brands of handcuff key in these handcuffs. TCH/Hiatt won't fit, Smith & Wesson won't fit, Peerless won't fit. The only keys that I have which fit and operate the handcuffs (aside from the proper Clejuso keys they come with) are ASP and Alcyon. As well as my own special TOOOL specification modified smith & wesson keys, which their very purpose is to be as compatible with the widest array of handcuffs known to man or beast. • They are comfortable. Not quite as comfortable as Peerless, but they are pretty damn comfortable to wear, of course as long as they are not over-tightened. • The open design has shown me that if you used a handcuff key from another brand that is not tall enough on the bit (the bit does not poke out from the key far enough) which would normally lead to a dead-locked key that is permanently stuck in the lock, with these handcuffs you could likely continue to turn the key and just go around again or remove the key as nothing seems to block it. I tested this by turning one key in the wrong direction and pressing the pawl down, which caused the key to rotate in the opposite direction towards being pulled out easily. • There is a button in order to double lock the handcuffs. It is crucial to double lock handcuffs in order to both prevent easy opening of these handcuffs (especially THESE which you can drive a tank up in there to open them) and also ensure the handcuffs cannot accidentally (or on purpose to blame the arresting officer for abuse) tighten and cause injury to the person who is wearing the handcuffs. • There is no ditch on the rotating arm. The purpose of a ditch is that a protrusion in the body of the cuff slides through it as the cuff is placed on the wrist. If someone is really strong and pulls outwards, without the ditch they may be able to pull the teeth of the cuff out of the internal pawl's teeth and free them self from the handcuffs. The ditch ensures that this force will be shared with the protrusion in the cuff which is lodged into a ditch inside the rotating arm. These handcuffs have no ditch. The only "possible" saving grace is they are chunkier laterally, meaning there is more metal horizontally that the person would need to put force against. Maybe this will help in the absence of the ditch. • There is only 1 pawl bar and it is very thin, meaning they may tolerate less force being put on them, causing the handcuffs to break and allow a strong person to free them self. Maybe. • The pawl tolerances are pretty high, in that there is SO MUCH ROOM at the base of the cuff when placed on a wrist, that you could drive a tank up in there to unlock them if they are not double locked. I shoved a big heavy duty bobby pin or hair grip in there and shimmed the handcuffs open. • The outer sandwiches of metal are somewhat thin. Thin enough that I can pinch hard and bow them closer together. This leads me to believe someone could pry the two sandwiches apart and essentially smash open the handcuff to free them self. • You can tell they are made cheaply because there is a lot of open areas in the handcuff. This lead you see the inside workings (which is interesting) and they only have 1 handcuff mould and use it for both sides. This leads to one key hole facing the front and one facing the back, instead of both holes being on the same side. This is a classic cheap tactic as they do not need to design and separately manufacture a mirrored handcuff bracelet for the other side. Most big name cuffs have a properly mirrored side. These do not. • They smell like gun metal, like an old west toy cap gun I had as a child. Just horrible. Possibly due to the different kind of metal used in the middle of the handcuffs. All American Peerless 700C Chain-linked handcuffs, used by Police and Prison systems. Unboxing & demonstration. These are exceptionally high quality handcuffs. Built very well and look great. They do catch fingerprints and smears on them which can make them look less attractive but when cleaned up they are stunning. They can backload by a single click, they have a good strong double lock feature and work nice and smoothly. Peerless are some of the most comfortable non-lined handcuffs I have ever tested. I do not know what it is but they make very good handcuffs. 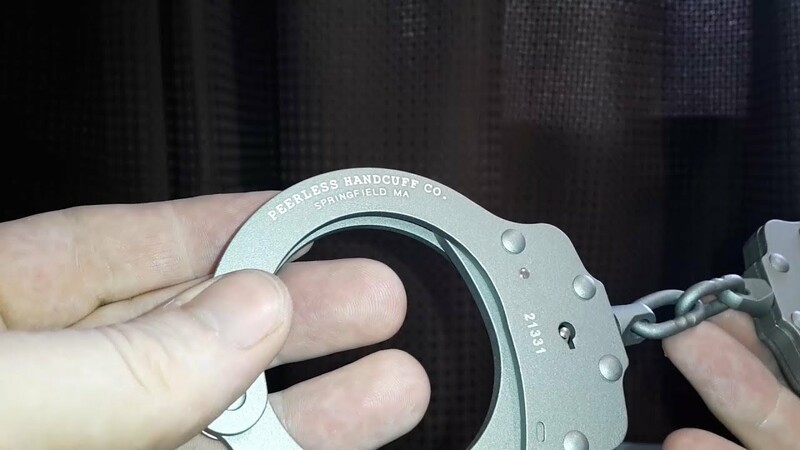 In fact, Peerless invented this design of handcuff a long time ago and now almost ever major handcuff in use in the world today uses this same swing-through design. 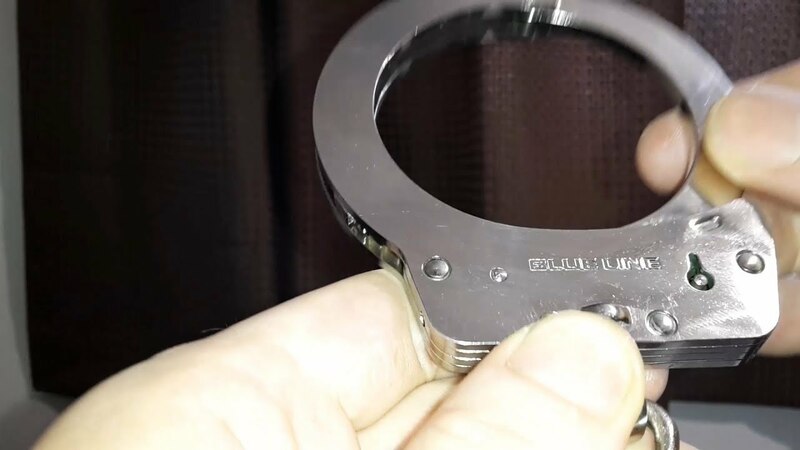 These are the very latest high security handcuffs used by the French prison system and for transporting high risk prisoners, also by some French police officers. They have two types of keys. A standard style barrel key, although it is far too massive for any normal handcuff key to fit, then there is a second key that they call a pin tumbler lock. I suspect this second key is actually a wafer lock based on visual inspection, regardless, this second key operates the double lock and makes these handcuffs exceptionally secure. Hands are horizontal instead of vertical as you would expect with typical handcuffs. This makes manipulating the keys more difficult due to the awkward movement that is possible as well as makes the fit of the handcuffs more exact and thus secure, due to the shape being more natural to that of human wrists. Similarly to the Ralkem Alfa-Proj cuff I previously reviewed, when you unlock the cuff in single lock mode, the bow gets very slightly tighter before it releases. 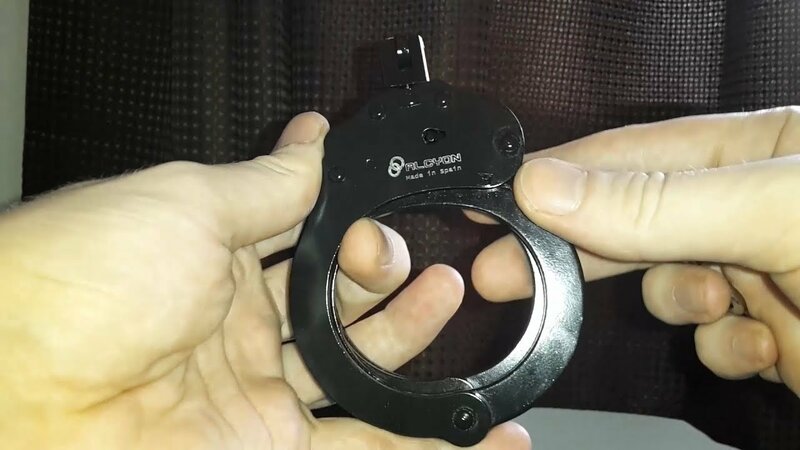 This is less pronounced than the Alfa-Proj but still, be careful not to over-tighten them to ensure effective and painless removal of the handcuffs. They are light weight too, made of aluminium with some parts being made of steel. I believe they weigh about 300 grams. They do have some ridges to help prevent shimming but with my windscreen wiper blade with my bend in it (to make it follow the curve of handcuffs) was able to successfully shim them open while single locked of course. You get 2 double locking keys and only one standard barrel key. Normal handcuff keys are FAR too small to ever fit into these cuffs, so buy extras, I got mine from cuffsland. 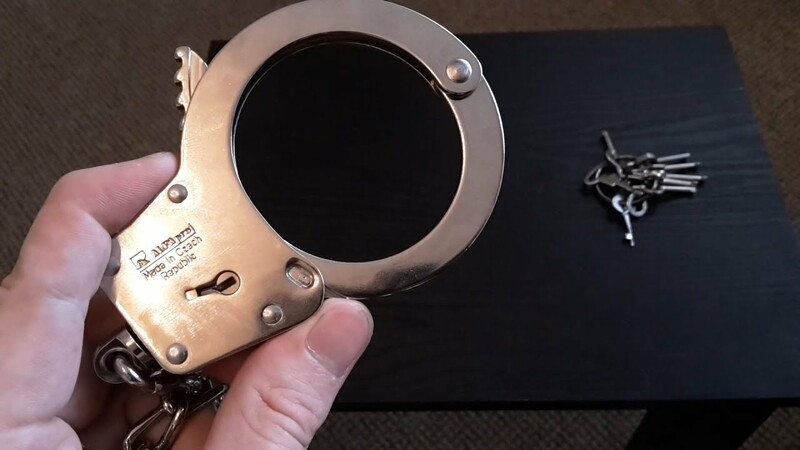 If someone is secured with these handcuffs in the double lock mode, it is almost impossible for someone to escape unless they have actual keys. 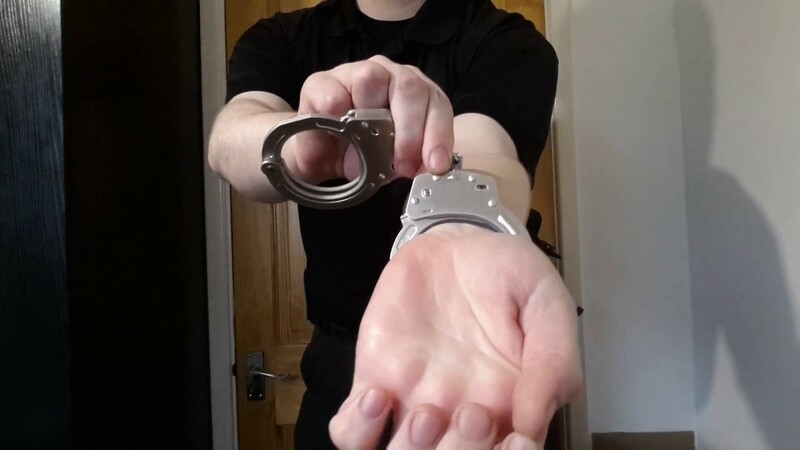 If you would like me to make a video demonstrating manual/self application and removal of the cuffs in double locked mode, please let me know and when I get chance I will demonstrate both locking mechanisms being applied and removed without needing anyone to do it for me. Can be attached to an immovable object like benches or the fixed bar on some tables in interview/interrogation rooms used in US law enforcement to ensure the person does not escape. They are extremely extremely smooth and hardly any effort is required to ratchet the arm, which makes double locking these cuffs during use even more important to prevent accidental tightening, which tightening these cuffs too far is a very very very bad idea as I am about to explain. When you turn the key to unlock these cuffs, the handcuff tightens by 1 click in order to release the handcuff. So if you tighten them on the wrist too much, there is no room left for them to get any tighter which means they could be stuck on the persons wrist and with the force needed to try and unlock them, end up snapping the key inside the lock. So always ensure there is a little bit of movement possible to enable them to be removed. The locking mechanism has a ward requiring their own special key with a double bitted end. You only get 2 keys and if you plan on using them I would recommend you try to source extra keys (cuffsland has some). They have shim protection as well. There is a dip to catch shims as well as tight tolerances. I have been unable to shim with any shim I have, including a super thin shim. So I would call these somewhat high security. Although once you know what the key looks like you can bend a paperclip and eventually get them open. If you wish please like and subscribe! See you next time. 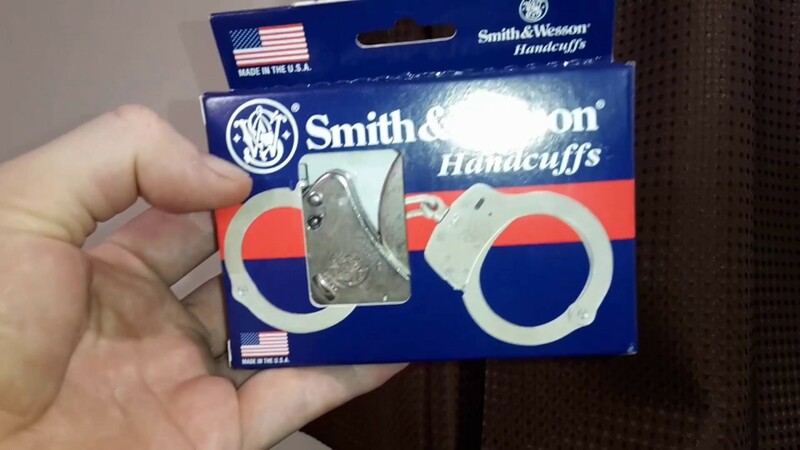 These are the Smith & Wesson 104-1 (M104-1) [the newer version of the model 104] MAXIMUM SECURITY handcuffs. They are used on the most dangerous and risky prisoners. They are HIGHLY pick resistant. They use a special, smaller than normal key with, obviously, a tighter keyway which makes sticking picking tools more difficult due to the constrained space. Other high security handcuffs are available to the US police and department of prisons but I believe the label of "Maximum security" on these is applicable here. Making cuffs require a 2 bitted key is difficult to pick but having 2 paper clips can get the job done. Trying to bend something thin as hell but strong as hell around that bushing would be quite the trick to pull off. These are not typically used by regular police officers because the keys are more rare and it would cause problems for releasing the person at the other end if the original arresting officer was not present. So they are typically only used during transport to prisons, on the worst people and in really serious places like death row. They come with 2 keys and locating extra keys to buy can be difficult, due to the high security, excuse me, MAXIMUM security nature of them lol. These are the original Hiatt chain-linked handcuffs, the ones that the British Police force were using prior to the introduction of rigid Speedcuffs. TCH (Total Control Handcuffs) company make these now, they are the TCH800 (model 800) handcuff, there is a video of them on this YouTube channel. Something I have noticed, is while the new TCH800 look nice and shiny, these Hiatt 2010 have nice edges of the cuffs (counter-milling, is it?) where instead of a hard edge right angle "L" They cut the corner of the L off so it is not as sharp against the skin. Still, both these hiatt and the new TCH are comfortable. The TCH have a subtle rounding I think, as opposed to this edge cutting off thing Hiatt did. These have shim protection that makes them more secure when single locked, they are hinged which provides a greater degree of control over a violent subject and they take a non-standard key*. The downside is that I believe quality control is lower in this brand of handcuffs. I believe that the silicone lined models that are NOT light-weight aluminum models will be perfectly fine. But these older models and light-weight models tend to work sometimes with standard keys, which is frustrating. Their leg irons do it, the previous Yuil hinged model I reviewed (and threw away in a few months later) also had that problem. 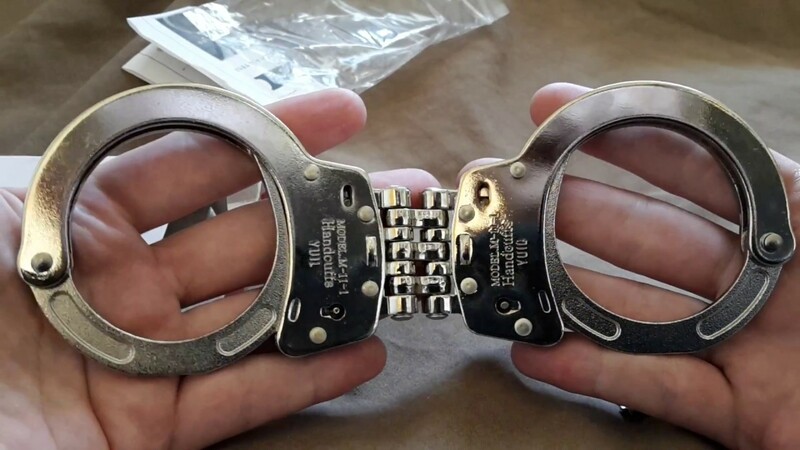 So, they are more secure than regular standard handcuffs but if the quality control was higher, they would be perfect and high security by requiring their special double bitted key. Yuil, if you make a handcuff that uses a non-standard handcuff key then please make sure it ONLY works with that non-standard handcuff key, else you are not providing any extra security with that key, you would be providing 'security theatre' As Bruce Schneier describes it. Please fix this issue, this is not the first time I have seen this happen. All in all, good, higher than usual security handcuffs. I just wish Yuil would put more care into their work these days. I would still recommend them though.